As part of the first edition of the Moroccan Jawhara Festival, Lebanese singer Carole Samaha threw 3 huge concerts where the number of fans who attended exceeded the expectations. Carole was the opening act of the festival where the first concert was held on July 22nd 2011, on the stage of “Sidi BouZeid”. She sang to her audience a collection of her old and new songs, the romantic and up-beat ones as well. The place was so overcrowded and everyone was trying to get to Carole. This made the security people lose control and thus they had to end the concert ahead of time. 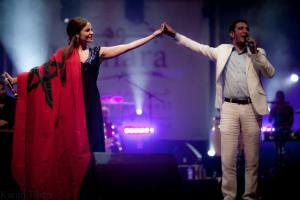 The second concert was the next evening, July 23rd in “Azmour”, and the third was on July 24th in “Al Jadida”. Both concerts were just as successful as the first one, but the last one had a little something extra. Carole received a very warm and heated welcome when she got on the stage, where the crowd was cheering her and wishing her a very happy birthday! Carole was very touched and expressed her great joy in celebrating her birthday on stage with her fans for the second time in a row. Carole Samaha is currently in Algeria for her next concert as part of her summer tour.